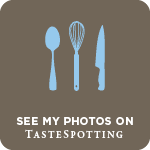 Earlier today I shared with you the recipe of a spicy Onion Pear Jam and as a teaser for what was about to follow, I shared a photograph of my herbed Manchego cheese soufflé topped with the spicy Jam. I had planned to post the souffle sooner... but then life happened and I had to wait till everything fell into place and I was free to jot down the recipe.. So here's the recipe of the cheese soufflé for you... 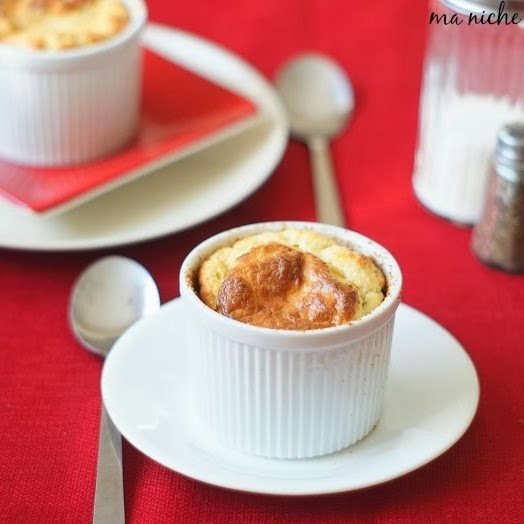 I adapted it from Dorie's recipe of Muenster cheese soufflé. A few weeks back I had tried out her recipe for French Fridays with Dorie and found it a little bland for my taste. Recounting the experience I tweaked the recipe this time to add more flavors and guess what.... this time it turned out great. The soufflé tasted delicious with the added herbs and spicy jam and this time both husband and I loved it. Position a rack in the lower third of the oven and preheat the oven to 400 ° F.
Butter the insides of three 8-ounce ramekins, dust them with bread crumbs and place them on a baking tray. In a small saucepan, bring the milk to a boil and keep it aside. Melt the butter in a medium-sized saucepan. Whisk in the flour and cook the mixture (roux) for 2 minutes, until the raw taste of the flour is just gone. Do not over cook the roux. Now whisk in the hot milk and beat the mixture to form a smooth sauce. Whisking continuously cook the béchamel for another 5-8 minutes till the sauce thickens and lines begin to appear when whisked. T this point switch off the heat and stir in the cumin, salt, pepper dried chives and grated cheese and mix well. Then whisk in the egg yolks into the béchamel and keep in aside. Using a hand mixer beat the egg whites until they hold firm but still glossy peaks. Stir in one quarter of the egg whites into the béchamel, then using a spoon gently fold in the remaining egg whites. Divide the batter among the prepared ramekins, filling each mold about three quarters full. 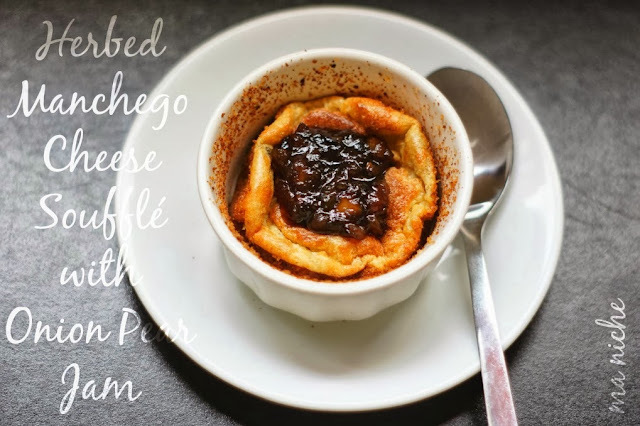 Slide the baking tray with the filled ramekins into the preheated oven and bake the soufflés for 20-25 minutes or until they are well risen, golden brown and firm to touch but still jiggly in the center. (Mine got done in 24 minutes). Following the recipe here, make the Onion pear Jam while the soufflés get done. 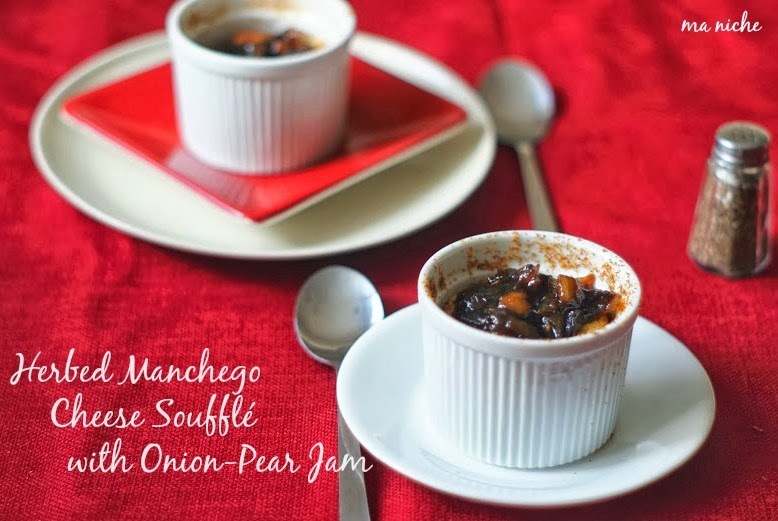 Once the soufflés are done top each with 1-1/2 tbsp of Onion pear Jam and serve. 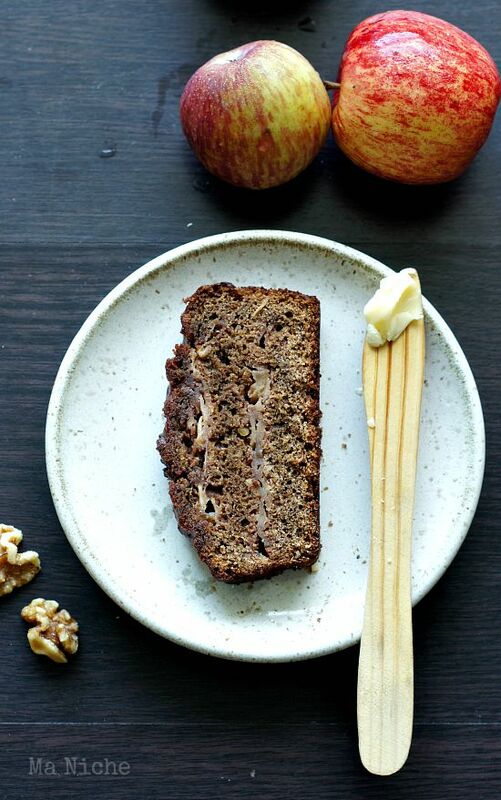 Book marking this recipe ... looking for a good recipe .. will let you know how it turns. Gorgeous!!!! 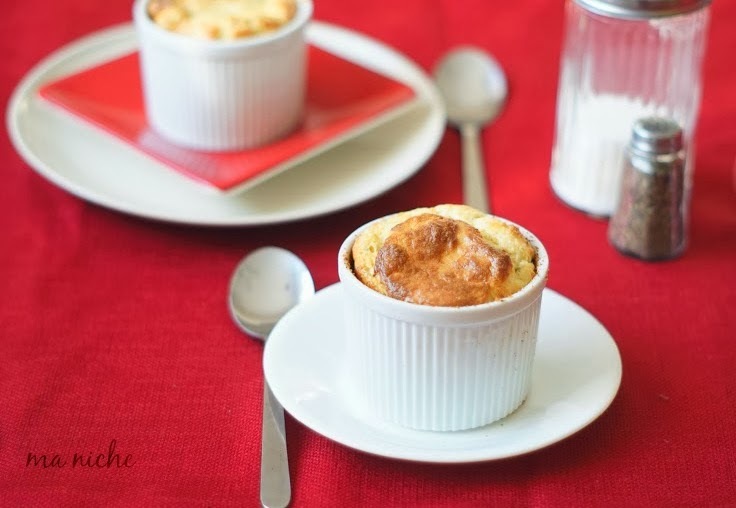 I adore cheese souffle and yours looks over the top delicious!!! These souffles are gorgeous and sound divine! Thank you for linking up with the Clever Chicks Blog Hop this week! Looks beautiful! Thanks for the recipe.